A Jewish father writes to his son about the single most important decision he will make. I know this might sound strange coming from a father who’s far from a religious Jew, but now that you’re dating, there’s something I need you to understand. The single most important decision you’ll ever make in life will not be about your education or career but about whom you’ll marry. Because who your wife is will determine, more than anything else in your adult life, the person you become, the family you’ll raise, what you’ll leave on earth when it will be time to go. I know the end of life isn’t something you probably give much thought to. Not many of us do, at least not until we became sick or old enough to see it hovering on the horizon. But a final day does arrive, sooner or later, for each of us. And when it comes, very few of the things we thought made such a big difference will seem to matter at all anymore. And other things we never gave much thought to will suddenly be very important. We’ll want to look back at our lives and feel that, in those areas, we pretty much did the right thing. Sean, the right thing for a Jewish person is to marry another Jew. Not only because our religion requires it. But because when Jews “marry out,” they disrespect who they are, they are disloyal to the Jewish past and they chip away at the Jewish future. Whether or not our family kept strictly kosher or celebrated the Sabbath or attended services often enough is all one thing. But the thought of bringing about the end of a proud Jewish line stretching back in time for centuries is something else. It’s more than some religious transgression. You never asked to be a Jew, I know. You were born one. But being Jewish isn’t a burden. It’s a gift. It means you are part of something bigger, much bigger, than yourself. Each of us Jews represents the hopes of so many Jewish ancestors. Don’t forget, you’re not just Sean, you’re Shmuel, too. And even if you only used your Jewish name when you made the blessings over the Torah at your bar mitzvah, it is still who you really are, an inheritance from your grandfather. And it was the same thing to him from an ancestor of his. You can’t just ignore the meaning of something like that. It’s a responsibility. All of my ancestors and your mother’s, all those Jews who came before us, lived, and sometimes died to keep their Jewish identity and heritage going. I know that love is a powerful emotion. That’s exactly why I’m writing this as you begin to date. The young women you become close to will form the pool where you’ll find the person you want to spend your life with. Don’t give yourself the opportunity to fall in love with someone you cannot, as a Jew in good conscience, marry. And never forget that what the world calls “love” isn’t all there is to a successful and happy life. Every marriage that ended in divorce or worse, after all, started in a rush of love. For a marriage to really work, there has to be not only attraction and care, but shared ideals and goals. And part of a Jewish man or woman’s goals has to be to take their Jewish identity seriously, and to instill it into their children. I don’t care whether the girl you marry is white, black or yellow. I don’t care if she speaks English, Hebrew, Yiddish or Swahili. I don’t care if she was born a Jew or became one, legally, properly, and sincerely. But if she isn’t Jewish, I know there will be tears, in your mother’s eyes and mine – and also in heaven. 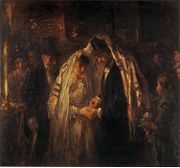 They say these days that most Jewish parents in America don’t care if their children marry other Jews or not. I hope it’s not true, but even if it is, we do. Remember what I’ve told you many times: Being a Jew means being ready to buck the tide, to say no to others – even a lot of others – when something important’s at stake. Sean, you’re the future of our family. I hope you’ll have the courage and the strength to do the right thing. April 2008: Dear Sean and Will It Be Clinton Or Obama?